An acoustic shadow or sound shadow is an area through which sound waves fail to propagate, due to topographical obstructions or disruption of the waves via phenomena such as wind currents, buildings, or sound barriers. 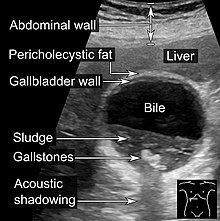 Abdominal ultrasonography, where gallstones create acoustic shadowing of the ultrasound, seen at bottom. A short-distance acoustic shadow occurs behind a building or a sound barrier. The sound from a source is shielded by the obstruction. Due to diffraction around the object, it will not be completely silent in the sound shadow. The amplitude of the sound can be reduced considerably, however, depending on the additional distance the sound has to travel between source and receiver. As one website refers to it, "an acoustic shadow is to sound what a mirage is to light". For example, at the Battle of Iuka, a northerly wind prevented General Ulysses S. Grant from hearing the sounds of battle and sending more troops. Many other instances of acoustic shadowing were prevalent during the American Civil War, including the Battles of Seven Pines, Gaines' Mill, Perryville and Five Forks. Indeed, this is addressed in the Ken Burns's documentary The Civil War, produced by Florentine Films and aired on PBS in September 1990. Observers of nearby battles would sometimes see the smoke and flashes of light from cannon but not hear the corresponding roar of battle, while those in more distant locations would hear the sounds distinctly. ^ "Science Over the Edge: A Roundup of Strange Science for the Month". January 2004. Retrieved 23 January 2012. ^ "The Civil War". Florentine Films. Archived from the original on 2 January 2013. Retrieved 23 January 2012. ^ Discussed in narration at the start of the documentary's fifth episode, "The Universe of Battle."